Experts suggest that the reasonable lifespan of a bed mattress is only about seven years, and if you haven't replaced your bed mattress lately, it might surprise you to learn how many variations there are, both in size and in construction design. Mattresses come in many sizes, and use different construction methods. Mattress sizes range from quite small nonstandard infant crib mattresses that are barely 2 feet wide and 3 feet long to huge oversized mattresses that are 6 feet wide and 7 feet long, on beds that take up the better part of many bedrooms. Here are the basics of mattress sizes. A variety of nonstandard crib mattresses are available for infant cribs and bassinets, but a standard full-size crib mattress must be at least 27 1/4 inches wide and 51 1/4 inches long. It must not be thicker than 6 inches deep. This mattress is designed to fit the full-size crib, which can have an interior width of between 27 3/8 inches and 28 5/8 inches, and an interior length of 51 3/4 inches to 53 inches. The mattress is intended to fill the inner dimensions of the crib so that there are no gaps that an infant can slide down into. Experts suggest that a child can sleep on a crib mattress until he or she is about 3 1/2 years old. A twin, or single mattress, which is the typical starter bed for a child, is 39 inches wide and 74 inches long. It is the typical mattress used on most bunk beds. An XL twin (XL single) is the same width (39 inches) as a standard twin, but at 80 inches in length; it adds 6 inches to the height of the standard twin. This is a good choice for growing "tweeners" approaching their adult height. The full-size bed, sometimes called a double bed, is 54 inches wide and 74 inches tall. It is a good choice for use by a single adult of average size. It can also serve two smaller adults, although they might be somewhat cramped. A full (or double) XL mattress is the same width as a full mattress (54 inches) but is a bit taller, at 80 inches in length. It is a good choice for taller adults. A queen-sized bed holds the most popular mattress size for adults in the United States. It's 60 inches wide and 80 inches long. It will be very spacious for a single sleeper, and will serve nicely for an average-size couple. A king-sized mattress is 76 inches wide and 80 inches tall. It offers very comfortable sleeping for most couples. Taller couples may want to consider a California king, which measures 72 inches wide and 84 inches tall. In addition to different sizes, mattresses come in several different construction types. This is the type of mattress that most people are familiar with, constructed of interior metal coil springs. First introduced in the 19th century, this is the most common mattress type in residential homes. Innerspring mattresses have traditionally been paired with a box spring, although this is no longer the case with modern innerspring mattresses. Quality varies widely with these mattresses, with mattresses with more coils typically offering better support and greater comfort. On top of the coils, manufacturers may add foams, padding or stuffing to provide a comfortable sleeping surface. This comfort layer can be several inches thick, and can be made from basic quilting, memory foam or latex foam. Innerspring mattresses are widely available everywhere, and basic models are quite affordable. They are also fairly cool to sleep on. Their life expectancy is relatively short, however, at five to seven years. First introduced in the 1990s, memory foam was developed by NASA as a substance to absorb the weight of astronauts during the high force of space launches. 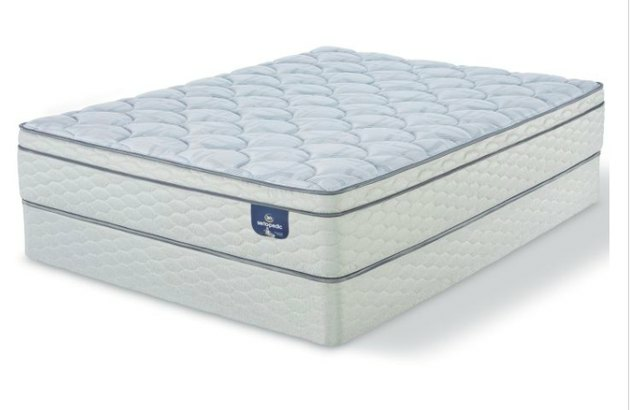 Memory foam contours to the shape of the sleeper to eliminate pressure points. A genuine memory foam mattress will have no inner springs at all, although many mattress manufacturers create hybrid mattresses that combine innerspring construction with memory foam layers. Cheaper memory foam mattresses break down fairly quickly, but better quality mattresses may last 10 to 20 years. They are very good mattresses for people with back problems, but some people find them hot and uncomfortable to sleep on. Memory foam also can be fairly expensive. Latex mattresses have been around since the early 1900s but have only recently become a popular alternative to memory foam, preferred by some consumers because they have a less "chemical" smell. Latex foam offers many of the same benefits as memory foam, including good support. Mattresses made of natural rather than synthetic latex are also known to be exceptionally hypoallergenic. Latex foam mattresses can be somewhat difficult to find — you may need to look to online retailers. They are a little more expensive than other mattress types, but are very durable, lasting 15 years or more. A pillowtop mattress is a kind of hybrid in which a comfort layer is laid over the top of an innerspring mattress. By definition, a pillowtop mattress is one in which several inches of additional padding are added. The padding may consist of regular foam, memory foam, latex, fiberfill, cotton or wool. Pillowtop mattresses are marketed as combining the best of both innerspring and foam mattresses, and for some users, this proves to be true. However, pillowtops may not hold up as well as other mattress types. The satisfaction factor for a pillowtop mattress is likely to be related to the material used in the comfort layer, along with the type of material used. Some consumers, for example, may dislike a memory foam comfort layer, finding it hot to sleep on, while others may like the support it offers to a sensitive back. Prospective buyers are advised to test out several types of pillowtop mattress to determine which one is best for them.